In an age when many youngsters refuse to abandon their smartphones long enough to embrace motorcycling, Jan Sallings has no such problems. The patriarch of a large Farmington, Arkansas family, he’s helped and encouraged no less than eight relatives to design and build their own custom streetbikes. A lifelong two-wheeled enthusiast, Jan Sallings caught the motorbiking bug as a boy, eagerly ogling the Allstate motorcycles in the family’s Sears catalog. “I went with my mom when I was about 8 to a store that sold vacuum cleaners and BSA motorcycles, and she had a hard time getting me to leave,” Jan recalled. Before long he’d convinced his Dad to let him purchase a worn-out Honda 150 Dream which was soon bobbed and adorned with Jan’s first-ever “custom” paint job. Later came a new Harley Super Glide in 1976 which he also customized. But soon the responsibilities of home, family and career took over and the Sallings garage was bike-free for several years. By 2009, the family had relocated to Fayetteville where Jan began collecting 1970s Honda twins, having long been a fan of the CB350s. “In 2009, after walking around Bikes, Blues, and BBQ, and seeing a lot of custom bikes, I decided to try my hand at building one. I had the 350 parts, and not much money, so I built with what I had,” Jan said. 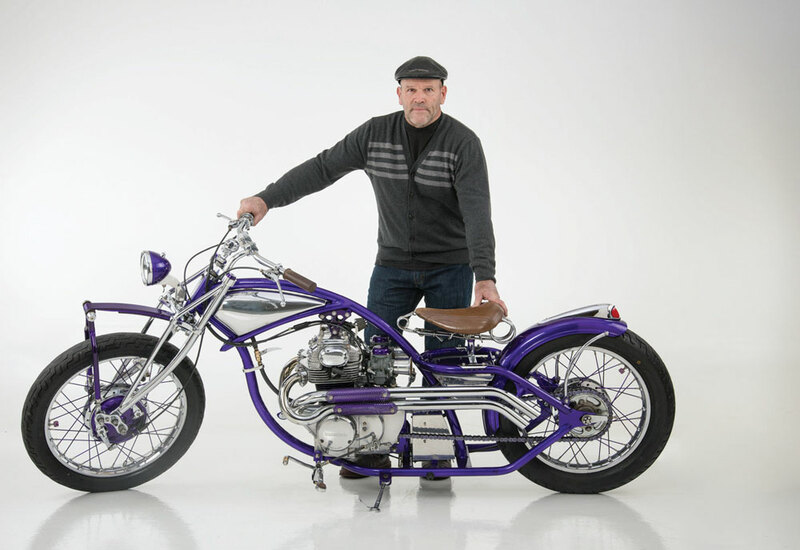 Drawing on his long-dormant workshop skills, he ended up building the 350’s chassis, front end, fuel tank, pegs, kickstand, and loads of other hand-fabricated bits for the radical, rigid bobber pictured here.The stretched and lowered chassis with its gracefully arched rails looks like anything but a first-time builder’s home project. There’s clearly some extraordinary talent flowing through the Stallings family’s blood. 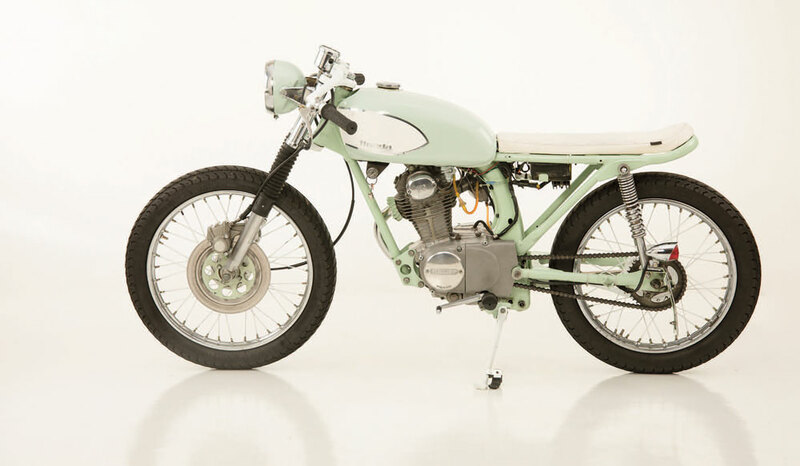 Once the Honda bobber was completed, Jan encouraged his sons to share time in the family workshop. 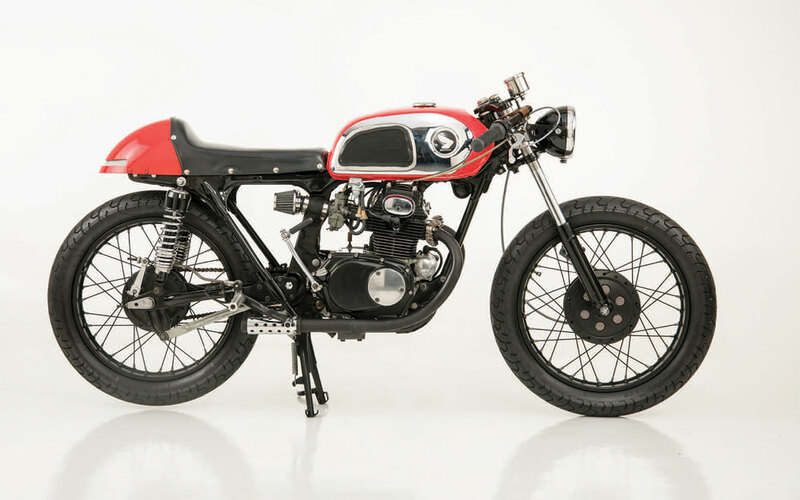 Each one embracing a Honda CB350, the clan waded into the challenge with a variety of custom visions in mind. To date, four Honda twins have been completed with a fifth – slated for a wild, school bus paint scheme and a radical monoshock rear end – still in the works. Being part of a motorbike-friendly family has its way of affecting everyone around, and before long, the girlfriends of Jan’s sons, Michael, John, Patrick, Max and Sean, all learned to ride on their own. The first to fall victim to the bike bug was Jenine (seen aboard the white CB160). 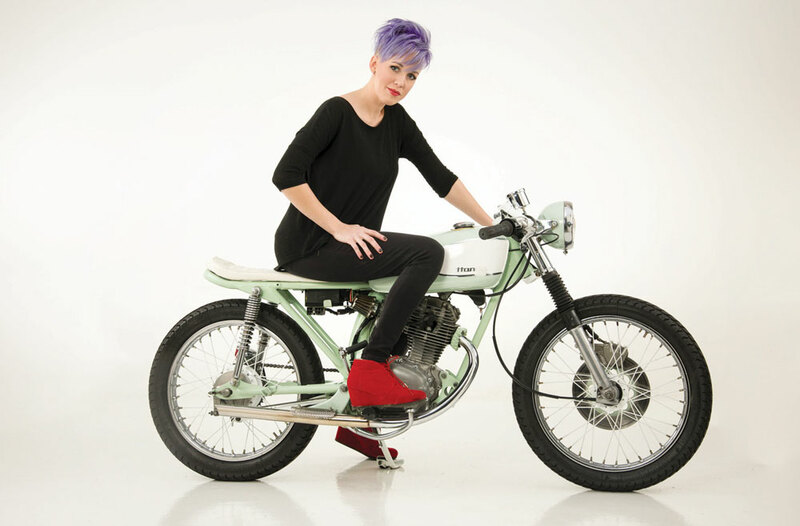 A dental hygienist by day, she spent many hours cleaning, assembling, and designing her bike, says Jan, and has won a few first place trophies. “I helped with the fabrication of the exhaust, rearsets, brass inserts, etc., and made sure everything worked as it should,” he said. “Kat, my youngest son’s wife, who is a graphic designer, was next in line. She rode with my son a couple of times, then decided that wasn’t going to do, so they bought a 1974 Honda CB175. She learned to ride it quickly, then did a little custom work to it, but when it broke a ring, she decided to do a complete rebuild. She was very determined to do as much of the work as she could, and did do a lot of the assembly and adjustments,” Jan said. 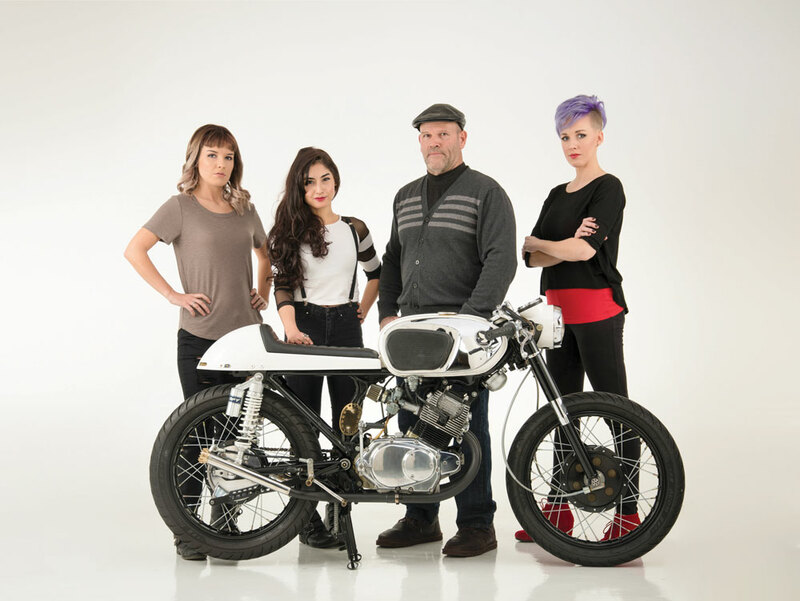 Though this was her first try at building a café racer from scratch, Kat also designed and did the custom work to the backbone of the frame while Jan helped with fabrication on the exhaust, rearsets, battery and electrical box. 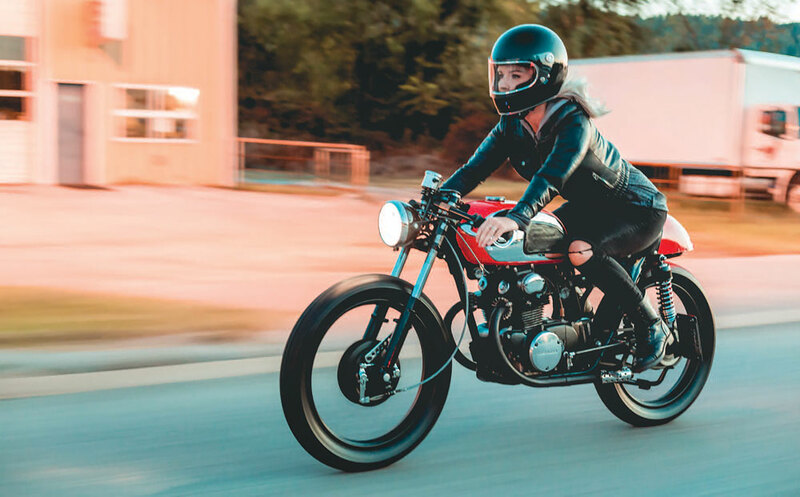 Jenny Lawson wasted few words when describing her favorite aspect of building a custom streetbike: “Making it start the first time,” she said. “Really I loved so much about it. Anytime I got to use the plasma cutter was always fun. I enjoyed making my seat pan with it and side covers and assembling the engine itself. It was like putting a puzzle together,” she said..
FRONT WHEEL: Powder coated rims, hubs. New spokes, brass screen inserts in machined hub. REAR WHEEL: Powdercoated rim and hub. New spokes. 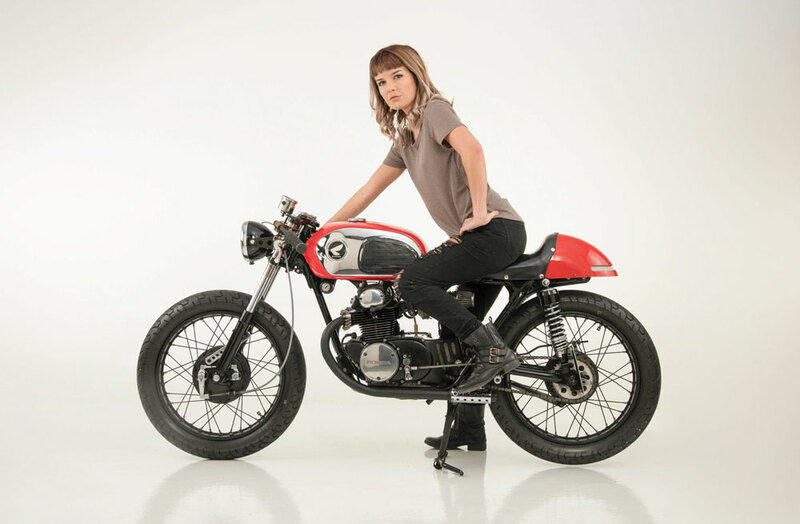 Dating a member of the Sallings family exposed her to cafe racers for the first time, Jenny said, and from there the appreciation for sleek two-wheelers blossomed. “I love how classy and how retro they look and I love how they aren’t too bulky and how minimalist they can be,” she said. 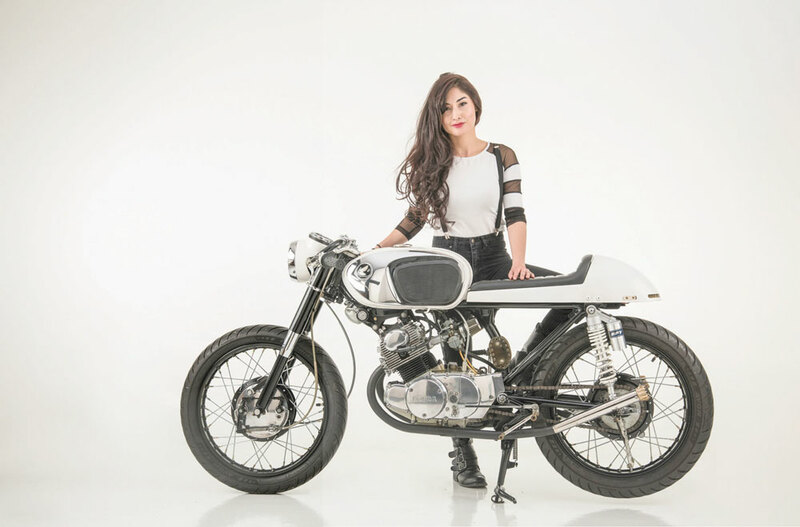 Jenine Sallings’ classic white Honda CB160 revealed to her a hidden engineer’s curiosity about engines and how they operate.“I loved getting to look inside the heart of an internal combustion engine. It was great to see how this amazing machine works and the tools it takes to get them there,” she said. She’s especially fond of pushing the twin through the twisty roads near her North Arkansas home, and digs the reactions she gets when parked up after a ride. “A five-foot Korean-American girl is not the typical rider/builder you come across. I get some people asking me about my bike when I’m obviously the owner, which I’ve always thought was odd. But I’ve had many people, particularly middle-aged men, bring up how they used to own an old Honda and they seem thrilled to see one restored and cruising the streets,” she said. With the wide-open mixture of custom bike genres and styles on display in the Stallings family stable – everything from post-WWII bobbers to choppers and racebikes and cafes are evident in all or some of the machines – their influences are tough to pigeonhole. Jan admits to appreciating “most bikes, but I was never a fan of stretched out, wide tire choppers and I won’t install a set of apehangers. I like the limitless creativity and uniqueness that I continually see in the café racer scene, and the classic bikes were just beautiful. The old Triumphs, Nortons, BSAs, Ducatis, and the early Japanese bikes just had a look that stated that someone cared about more than just function. My café 350 is painful for me to ride because I’m old, but I’ve put 8,600 miles on it because it is so much fun,” he says. The family plan to launch a website soon detailing their custom work and builds they’re willing to perform for customers. Asked what advice she’d provide for other women contemplating a custom bike project, Jenny was insightful to say the least. “If the desire is there, then don’t let anything stand in your way for men or women. There will be lots of days you feel very accomplished during the build and days you want to throw rocks at it, but don’t give up!” she said. TIME TO BUILD: Approx. 100 hrs. TIME TO BUILD: Approx. 400 hrs. FUEL TANK: 1969 CBD 175, modified to fit frame. HANDLEBARS: Clip – ons . SEAT: Dime City Cycles, modified to fit taillight.